These high-quality three-ply napkins are printed with a screen process to produce bright, vivid colors and crisp, sharp images. 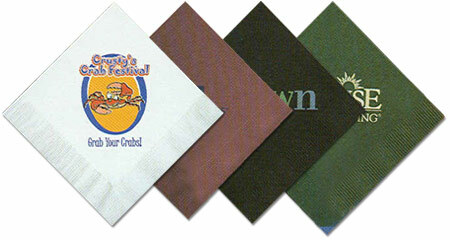 Choose from 10 different Napkin Colors with single or multiple color imprints (PMS color matching is also available). We can center your design using either "Normal Placement" or "Square Placement" (see examples below). The minimum order is just 100 custom-imprinted napkins. Screen printing/production time is only 5 business days. 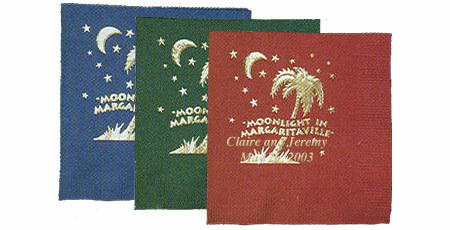 Our Custom-Imprinted Cocktail Napkins are 3 Ply and measure 5 x 5 inches. 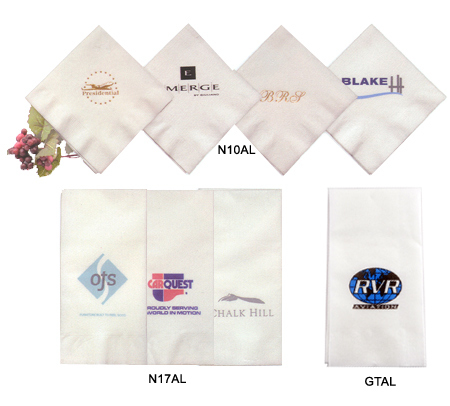 N101W White Beverage Napkin 0.35 0.28 0.23 0.21 0.19 0.16 0.15 3" 3"
N101C Colors Beverage Napkin 0.35 0.28 0.24 0.23 0.21 0.18 0.16 3" 3"
Specify the color of napkin you want and the PMS number or a color swatch to match or the imprint color. $60 plus $40 running charge per thousand. (Applies to metallic color imprints). N131W White Luncheon Napkin 0.37 0.28 0.25 0.23 0.22 0.20 0.19 3" 3"
N131C Colors Luncheon Napkin 0.37 0.28 0.25 0.23 0.22 0.20 0.19 3" 3"
Our Custom-Imprinted Dinner Napkins measure 17 x 17 inches and are available in two styles: 1) 1/8 folded, to create 4-1/2 x 8-1/2-inch rectangle napkins and 2) 1/4 folded to create 8-3/8-inch squares. N171W White Dinner Napkin 0.47 0.36 0.31 0.28 0.26 0.23 0.22 3" 3"
N171C Colors Dinner Napkin 0.47 0.36 0.31 0.28 0.26 0.23 0.22 3" 3"
GT1W White Guest Towels 0.64 0.56 0.52 0.50 0.48 0.44 0.43 3" 3"
Our Custom-Imprinted Linen Style Dinner Napkins measure 17 x 17 inches and are available in two styles: 1) 1/8 folded, to create 4-1/2 x 8-1/2-inch rectangle napkins and 2) 1/4 folded to create 8-3/8-inch squares. These unique napkins and towels are soft to the touch, absorbent, and perfect for high end establishments. N101AL Almost Linen Beverage Napkins, White 0.46 0.37 0.33 0.31 0.30 0.27 0.25 3" 3"
N171AL Almost Linen Dinner Napkins, White 0.58 0.56 0.50 0.47 0.45 0.40 0.39 3" 3"
GTAL1 Almost Linen Guest Towels, White 0.56 0.46 0.42 0.38 0.36 0.30 0.29 3" 3"
For additional information on our Customized Napkins, including Offset-Printed Napkins for Large Orders, please contact us at 1-800-233-0828.